The cinema (opened in 1901), known as ‘The Glen’ and ‘The Royal Animated Pictures’ once formed part of the Good Templar Halls (now occupied by Burton’s shop). On the afternoon of 31 December 1929, during a children’s matinee, a freshly shown film put in its metal box in the spool room began to issue thick black smoke. Soon the smoke filled the auditorium containing about one thousand children. Panic set in. Children ran downstairs so fast and in such numbers, that they piled up behind the escape door which led to Dyers Wynd. The door could not be opened, as it was designed to open inwards. 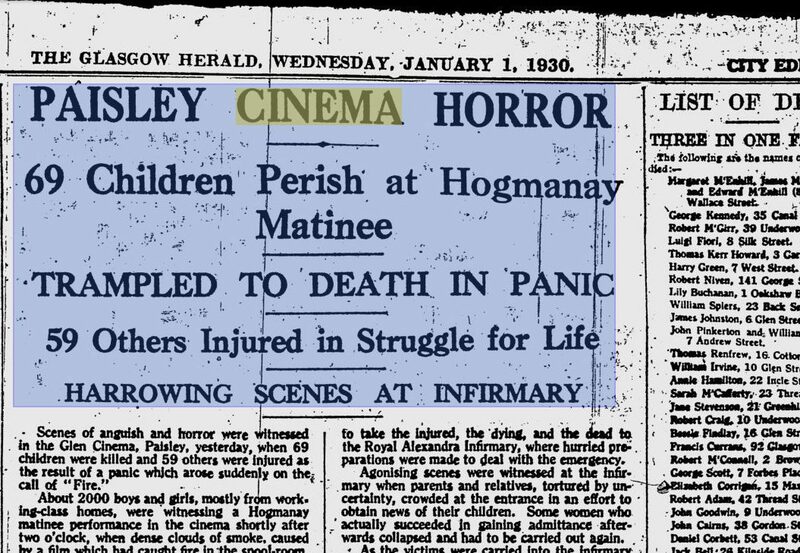 The following day, Paisley was stunned by the news that seventy children had died in the crush in the worst cinema disaster in British history. The irony was, there was no actual fire. Here are the picture’s of the Glen Memorial “all 4 sides” in Hawkhead Cemetery. The Papers at the time of the disaster.